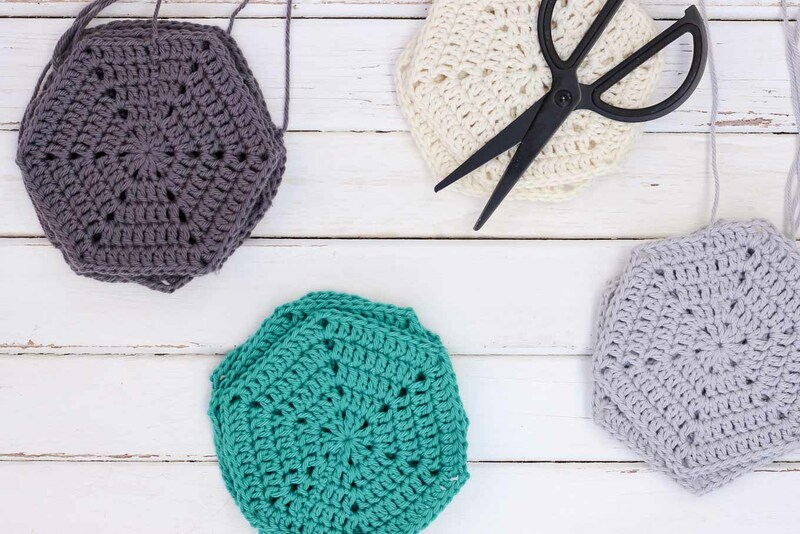 If you’ve ever wanted to know how to join crochet hexagons, granny squares or other crochet pieces together with a non-bulky, invisible seam, this is the tutorial for you! When it came time to sew these puppies together, I was looking for a joining method that wouldn’t add any bulk or visual distraction to the hexagons themselves. 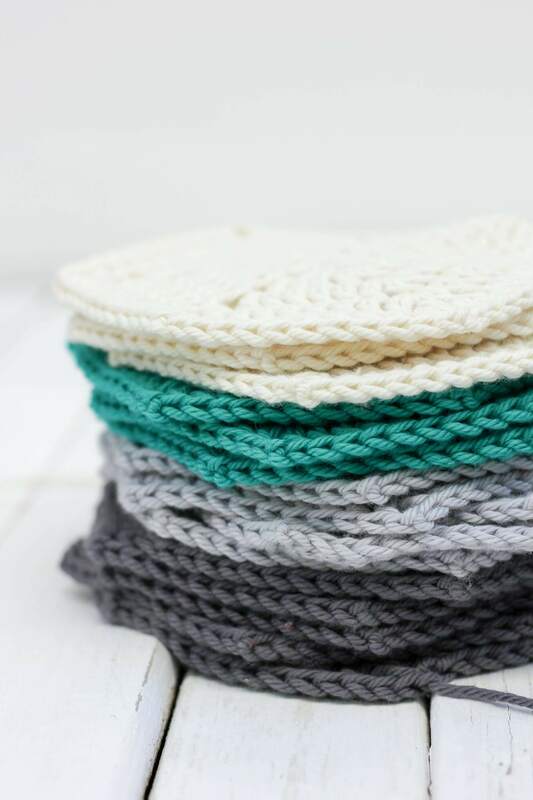 On her podcast, Craftish, Vicki Howell recently called crochet an oral tradition. Now THAT is a definition made so much sense to me. There’s not a right way to crochet. There’s not a wrong way. There’s just yarn and hooks and creativity. So if you, like me, have ever felt burdened by the idea that you need to learn the “science” of crocheting so you could get some phantom A+ in crochet school, I hereby give you permission to let that idea go. 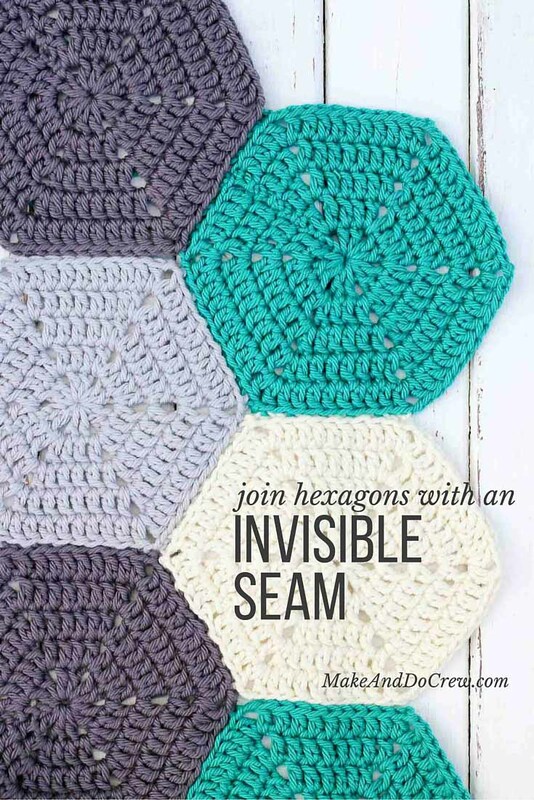 And with that, I will show you how to join crochet hexagons with a clean, invisible seam. Is it the only way to do it? Of course not! Does it do the job and look pretty? Why yes. Good enough for me then. First, I highly recommend that you block your crochet pieces before sewing them together. 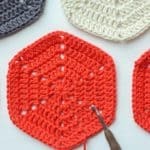 Check out how to make a super inexpensive DIY blocking board and come back when all your hexies are blocked to the same size. You want to keep your pieces lined up so that the stitches are always being sewn one for one. 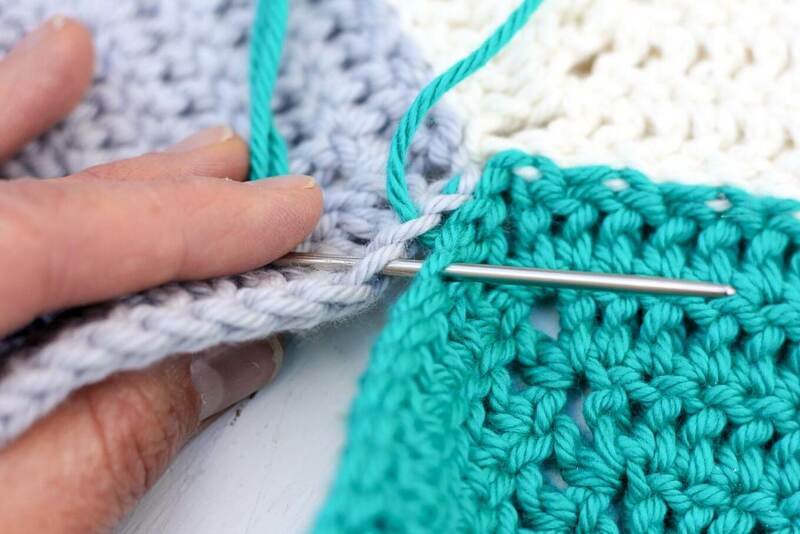 If your stitches get out of alignment, you will end up with weird puckers or uneven angles at the junctures. To make the seam the least noticeable it can be, use yarn that matches one of the hexagons that is being seamed. I find it easiest to line the pieces up and keep the seam horizontal in front of me while I’m sewing (as pictured below). This allows me to use my dominant right hand to go back and forth from top to bottom of the seam without switching the needle to the other hand. 1. Line two hexagons up together, right sides facing down. 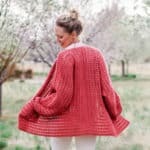 You will do all your seaming on the back sides of your crochet pieces. The two sides should both have the same number of stitches, so all the stitches on one piece should more or less be lining up with a buddy on the other piece. 2. Insert your tapestry needle through the back loop of the the chain corner stitch of the bottom hexagon and then proceed through the back loop of the chain corner stitch of the top hexagon. Pull the yarn through, maintaining snug tension, but not pulling it so tight that it puckers. 3. 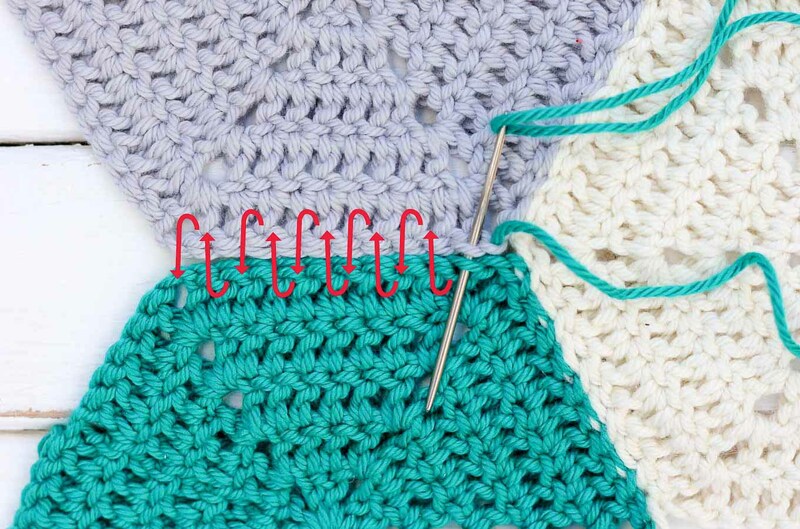 Insert your tapestry needle through the back loop of the next stitch on the top hexagon (a dc in the case of this hexagon pattern) and proceed through the back loop of the bottom hexagon’s next stitch. Here’s another view that shows how you’re only ever working the back loops of the the stitches you’re joining. Also, note how you are never bringing the yarn over the seam, but rather working it back and forth under the back loops. This ensures that the seam remains as invisible as possible. 4. Continue like this, working from the bottom hexagon to the top hexagon and then from the top hexagon to the bottom hexagon. Repeat until you’ve run out of stitches and have reached the corner chains of your hexagons. Work your needle under the back loop of the chain stitch that is closest to your seam on each hexagon. At this point, you can add another hexagon to the side of one of the hexagons you’ve just seamed. Since I was already working with teal yarn on my needle in this case, I would proceed around the teal hexagon, seaming one hexagon to each side of the teal hexagon and then go back and seam the un-sewn sides of the new hexagons. To do this, I would repeat steps 1-4 for each hexagon I add. 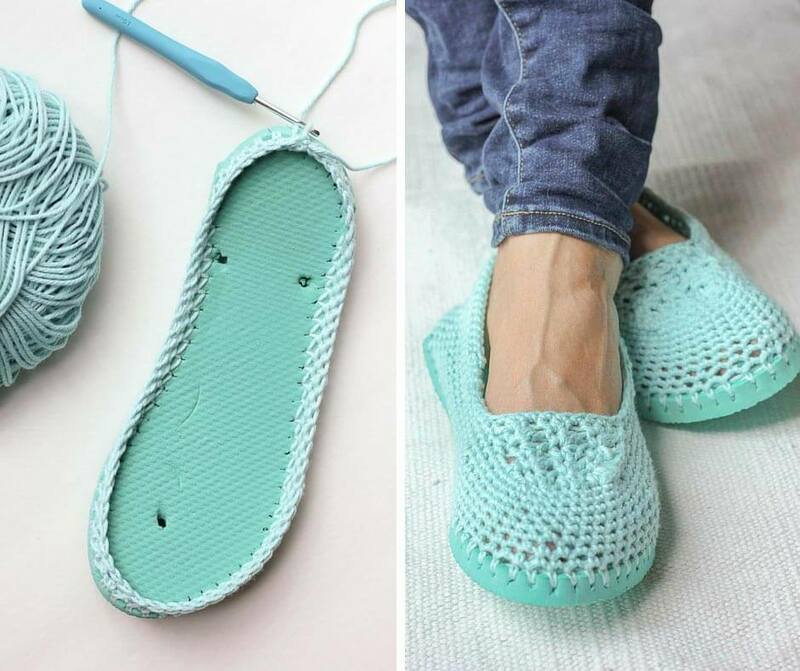 « Crochet toddler “boat shoe” slippers with flip flop soles – free pattern! I am so excited to find this simple but incredible way to join pieces together! Could you please tell me how you tie off the yarn when finished? 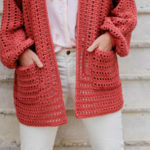 I have been cricheting for 30+ years, there are no rules in crochet, just do whatever feels right for you. I to always use knots, they do help all iteams stay together and last much longer. There are times like for iteams ment for children if I swing acrylic I will take a lighter and lightly burn/ melt my knots that way I know no amount of pulling and washing will unravel my knots…lol. Extra security lol.. I have seen to many of other peoples projects come apart, or always have tails hanging out, if those keep getting cut out of the way eventually they become to short and then hole thing unravels.. So yes knots are a good thing.. I also start all knew colors with a slip knot secured in place. ? Sorry for my errors, I didn’t double check before posting. unirlos es fácil, todos se los une en horizontal y vertical, pero unos quedan más afuera, OTROS QUEDAN MÁS ADENTRO , pero no quedan lineal , para que quede en forma de línea recta tenemos que realizar la mitad del hexágono y esto es lo que quiero que me enseñes, y haciendo la mitad del hexágono queda excelente, por favor ayúdame, tengo los hexágonos para una colcha cama doble, pero no me cuadran, para mí es hacer la labor mitad del hexágono, pero no puedo hacer la mitad,como voy cuadrando. Thank you for this great tutorial! Nice job and beautiful hexies! Thanks so much, Carol! Glad it was useful for you. Gorgeous! Thanks for your sharing your skills and work. Let me know if that doesn’t make sense and I’ll try to explain it another way. Your instructions are really clear and useful. And also very funny, too! 🙂 Thanks for sharing them with us. Haha-I’m so glad you found them useful (and entertaining!) Happy crocheting! I am 80years old and this is the first easy joing I have ever found. Been crocheting since I was 14. Thank you for this as I am trying to figure out how to put 3 inch squared granny squares for a baby afghan. I like this tutorial – it seems so easy to do. I have a question, though. When you flip it over when done, so the right side is facing up, because you only connected the hexagons through the back loops, is there any kind of gap between the blocks in the front because the front loops are not connected? Thank you for your fun and easy to follow tutorials. I’ll have to find the one for the half hexagon too! Hello! I am very new to crocheting (relearning) and thought that doing the hexagons would be a great learning experience. I’m nowhere near stitching anything together, but I’m trying to figure this out! 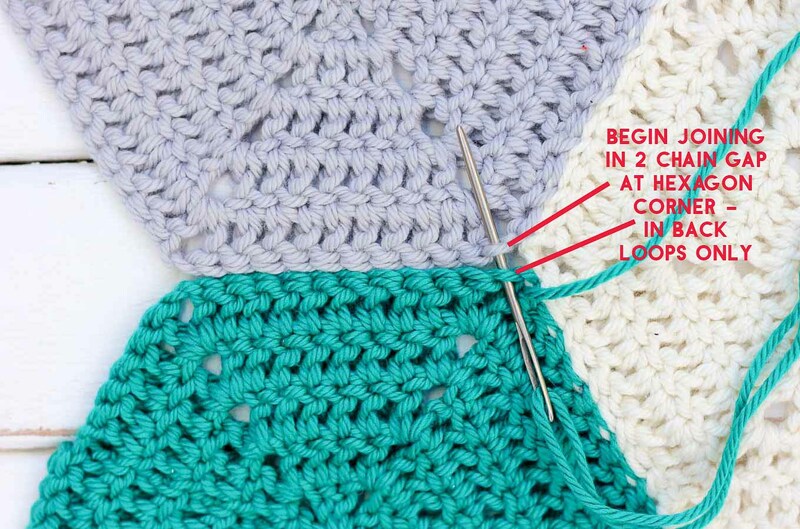 So when you finish the stitch for that particular color/ hexagon, is the knot noticeable? I don’t want multiple knots just hanging off the back of the blanket, I guess is what I’m trying to say. The finished product is beautiful by the way! Thanks for sharing! Thank you! 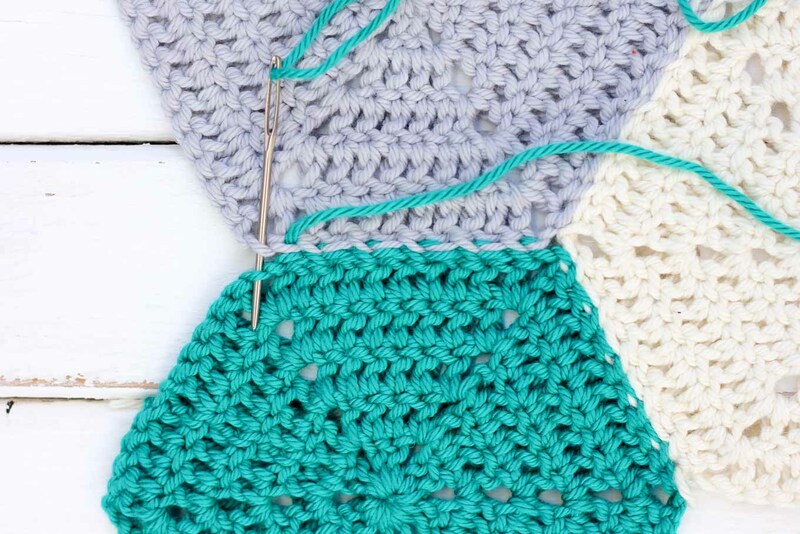 Here’s a trick I did with my blanket–when I finished a hexagon, I left a pretty long tail (like 15″ or more) and pulled that tail through my last stitch loop to create a sort of knot. Then, I used those tails to sew the hexies together whenever possible so that there were fewer knots that had to be made. For the strands that weren’t ultimately used to sew hexagons together, I used a tapestry needle to weave the tails back and forth through the back of the afghan to weave in the ends. 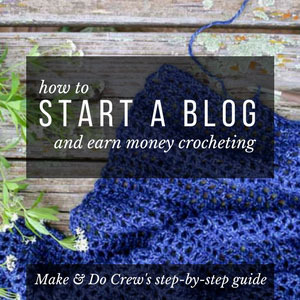 Moogly has a great roundup of ways to join crochet pieces. 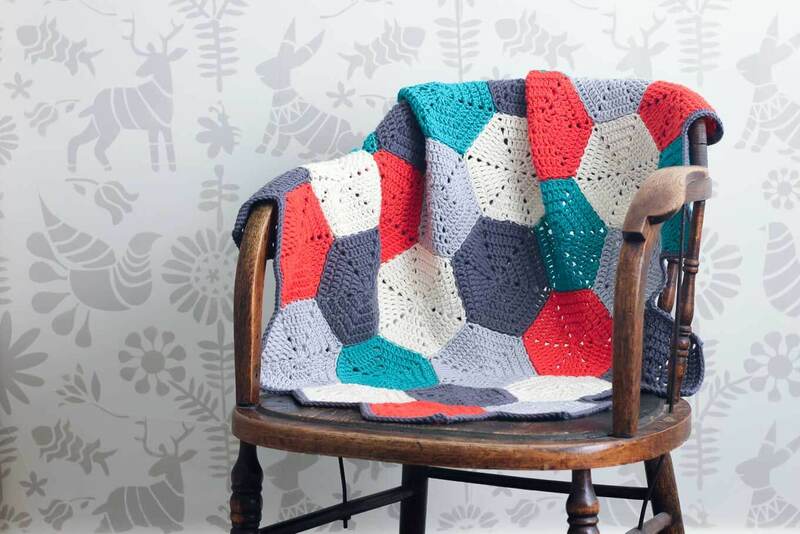 I wonder if there might be something there that would work for your grandson’s afghan? What I’ve done is one single crochet border around each hexagon in the same color as the hexagon. Then another sc border in the neutral color you speak of. This for each hexagon. 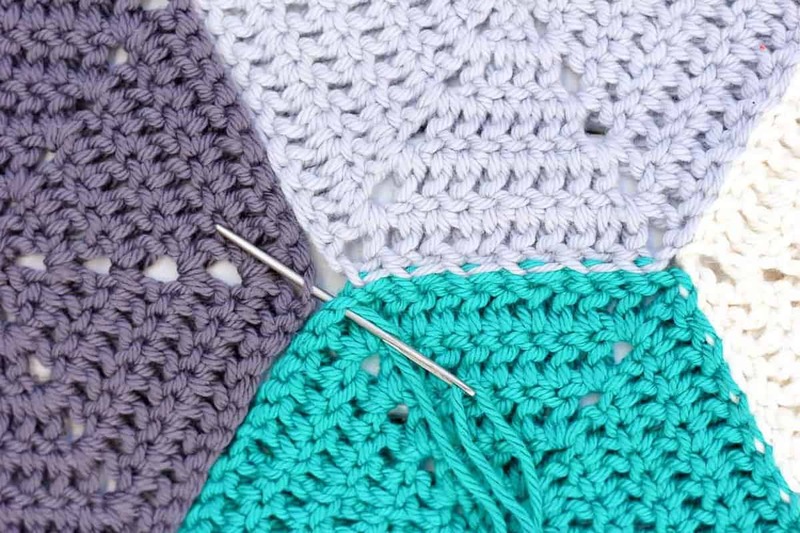 Then, the joining stitch goes through that neutral color of each hexagon, giving that divider you’re looking for. I like that look too. How do you thread the needle? As in do you overlap so that two pieces of yarn are going through each patch or do you tie off the yarn at the eye so you’re just pulling one long piece of yarn through everything? And do you cut like a 12in piece of yarn and join as much as you can with that and then cut another piece to keep going or can you theoretically just keep jointing with the same yarn string? 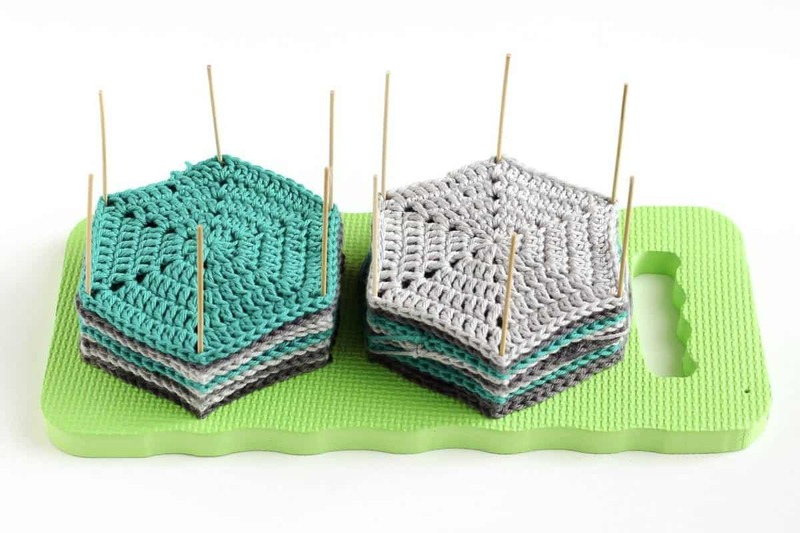 Hi there, love this hexagon pattern/these instructions. Thankyou!! I’m new to crotchet and am making any blankets for my twins who are due in two months. I’ve just finished one, but want to find a way of doing something around the edges that will make the blanket more of a traditional rectangular shape. Any suggestions of what I could do with sides to make the sides straight? Congrats on your soon-to-be-born babies! My sisters are twins and I loved growing up with them. You might like to make some half hexagons to fill in the gaps, which would only leave a sort of chevron edge on two of the sides. (You could fill that in with triangles as well.) I have a half hexagon tutorial here and you could make triangles using the “triangle” section of this pattern to get an idea of how to do that. 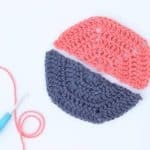 Happy crocheting for your babies! I love this tutorial! Thank you so much for sharing it. I have been slowly building a stash of hexagons for the last few months and am at a stage to start joining them now. I have used chunky wool for my hexagons and am thinking about using dk wool to join because I have run out of chunky. Can you think of any disadvantage of using dk to join chunky hexagons?